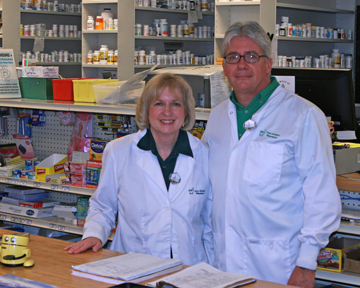 Randy and Susan also believe strongly in staying on top of new findings in the pharmacy field with continuing education courses and place a high value on quality. In fact, they participate in a formalized Quality Improvement Program for the pharmacy which documents ways to continually improve quality and maintain their commitment to customer service excellence. Susan finished her training in functional diagnostic nutrition (FDN practitioner) and she is ready to help work with you to improve your health. Our other pharmacist, John also has many years of experience and impressive qualifications. Our company’s technicians, clerks and drivers complete a team which is able to offer unparalleled service and delivery convenience. We have access to a local wholesaler and can get medications quickly if needed.